The minute Sproggett entered our world was, naturally, one of the best moments of my life. It was also absolutely the very worst, without a doubt. I’d been having contractions since the early hours of Saturday morning. After a long day of being fully dilated all Sunday, although he was fine I was tired. It may have been nominally down to hospital protocols, but it was clear to everyone including us that time had come to move me from the birthing centre to the labour ward. I’d done diamorphine, hours in the pool, a lengthy pushing session on a birthing stool. They’d broken my waters, put in a catheter to drain three litres of wee – even the midwives were surprised at that (“We’re going to need a bigger bowl!”) My contractions had slowed to almost ten minutes apart and this baby wasn’t coming out without help. I remember telling the consultant that by now, I didn’t care if I had to have a c-section as I just wanted him out safely. Safely being the key thing. I lay in the ward waiting to go to theatre with a Syntocinon drip reinvigorating my poor old tired uterus and just tried to focus on not biting straight through the gas and air mouthpiece – this was the most painful part of the whole process from my addled memory – and on seeing our baby very very soon. He ultimately needed to be turned with forceps and he’d had his hand in front of his face so all the pushing in the world wouldn’t have helped. Our baby was wrangled out, and flopped on to my chest, and his blue eyes gazed up at us, for a few unfocussed seconds. Then he was gone. I didn’t see any of this from my prone position but Mr D watched the consultants continue to ‘pull everything out’ of me, while a team worked on Sproggett in the corner. Despite displaying strong stats all the way through my thirty hours of established labour, he came out into the world without the lusty cries that Hollywood uses as shorthand for the birth of a baby. He was resuscitated for six minutes, which translated to us as hours and hours of waiting for news. I couldn’t even process that something seemed to be terribly wrong. I eventually spoke to the ceiling and asked for an update on the baby. A rather unfeeling clinician gave us the details, and something she said prompted me to ask if there would be brain damage. Rather than contextualise the risk which was small, she was oddly almost cheery as she told us that yes, it was certainly a possibility. He was already gone to the Special Care Baby Unit by then, and Mr D went to see him. I was stitched, placed on a drip. I skyped my mother to announce that they were grandparents once more while trying to keep my tone light, as I said that he was gone to the special care unit. Minutes later our fabulous delivery midwife came to see me and saw my distress, she immediately assured me that the baby was fine but it was hard for us to believe. Why did the doctor not say as much if there was no real cause for concern? We never saw the doctor who’d worked on him again. The midwife took my phone upstairs and snapped lots of photos of him. Mr D came back, and we burst into tears together, filled with terror and tiredness. Then we waited. We did find out after a couple of days that no other doctor had any questions or worries about Sproggett at all but that was after we spent more than 48 hours in a horrible daze wondering what tests would tell us, and when we’d get our precious son back, as we stayed across the hall on another ward. He was in SCBU for four days as they administered antibiotics and ran tests. After four days it was almost like they’d forgotten to actually articulate to us that he was not causing them any concern at all. I learned that if I wanted answers I essentially had to wait and snare a doctor rather than waiting for them to come to me. Talking to NCT friends who were also kept in with their baby revealed that the same doctor, with the same peculiar gleeful tone, told them their son might have meningitis. By then we’d all decided she’d be better off kept away from the public. The sister on our ward was invaluable in helping us to get everything lined up for a successful discharge on the Friday, which still took from 9:00am to 5:00pm to complete. We scooped up our little man and ran! We got home on the day of the Olympics opening ceremony, and I attempted our first at-home breastfeed as the Red Arrows flew past our bedroom windows. Danny’s Boyle’s tribute to the NHS unleashed all the pent up tears from the past week – they’d brought our boy back to life. This new little family finished the night lying on our bed, watching the final fireworks light up the sky and feeling like it was Sproggett’s welcome home. We spent the next weeks relaxing together with him almost always lying on one of us if he wasn’t asleep in his basket, making up for those lost first few days. When you do antenatal classes, the emphasis is almost exclusively on the actual birth. Sometimes you’ll cover basics like taking a nappy filled with pesto off a plastic doll, to familiarise yourself with the essentials. But for all that they arm you with knowledge on how to assert your rights and have the birth you want, and what to expect, nobody talks about what happens if things don’t go to plan after the baby arrives. Here’s what I wish I’d known before about SCBU, and as a newbie parent. Don’t ask permission to do things like visit, just present yourself there if you’re physically able. You might have to go in a wheelchair and be taken by a hospital porter soon after delivery, but you should be allowed to visit your baby as soon as you’ve recovered from any drugs administered during labour, like an epidural or spinal. The first assistant we spoke to, nighttime agency staff, obviously wanted us out from under her feet at 1:00am and suggested returning at 10:00 when the doctors would be there. We were too worn out and I was too drug-addled to argue so we turned to leave. Luckily the ward sister happened to come back then and asked if I was Sproggett’s mum, and would I like to do some skin to skin cuddling? Hell yes! Give me my damn baby! I recommend finding the ward sister and explaining that you want to be present as much as possible. SCBU is quiet orderly chaos – it’s a room full of mostly small, fragile babies who are often in great need of help. In our hospital it was run by very talented nurses, who loved babies. They’re also very very busy. Show them you want to feed, dress and change your baby like any new parent and to be present for doctors’ rounds. They taught us, by watching them with other babies, how to do all the basic care for the little man. If mums are as sparko as I was in the first forty-eight hours, dads are generally welcome too. Don’t worry about outstaying your welcome. If your ward wants you back for meds or food or tests, then they should know that you are in SCBU with your baby and so they can summon you to return (do make sure to tell them where you’re going). Some of your ward’s deadlines will be more crucial than others, as in it’s important to take painkillers at regular intervals. Then again, they wake you up at 6:30am to pop pills because it suits them as the nurses are about to go off shift. If that’s when you happen to be over in SCBU feeding your baby, maybe it can wait half an hour? Negotiate. There may be ‘rooming-in’ rooms in Special Care where you and your baby can stay together – ask. Sometimes they’re for babies that need longer stays. But if one is free, then it’s useful for you and your new baby to get some private time together, perhaps try breastfeeding without being in the midst of a sea of incubators. If you are planning to breastfeed, be aware that regardless of the hospital’s policy on supplying formula on the general wards, they may use it on SCBU and they may start your baby on it. If you really don’t want that to happen – though it may be the best thing for the baby at the time so listen to staff and doctors – then you’ve got to be there, attempting to breastfeed or expressing colostrom which you can finger feed or feed using a cup or syringe. Be clear with instructions and be prepared to politely repeat yourself. If your baby has a canula in his hand for administering drugs, a small child’s sock covers it nicely. Keep asking for things til you get them. The staff are all busy. Keep asking politely but firmly until you get the help you need and bear in mind that if you let a nurse or doctor out of your sight then they’ll probably get caught up with another patient. Explain the situation to every member of staff that you meet, if necessary. Keep a notebook and pen with you. Write down what doctors tell you because you really won’t remember it later, or possibly understand it. Tell all the staff that you want to see the doctors after rounds for an update on your baby. Be aware that this could take a couple of hours. While you probably have friends and family going up the walls waiting to hear about the arrival of your baby, they’re usually waiting to hear about the safe arrival. There’s no need to livetweet it all, don’t feel bad if people want to come visit and you’re not ready, you don’t even have to tell anyone they’ve been born until you are good and ready. 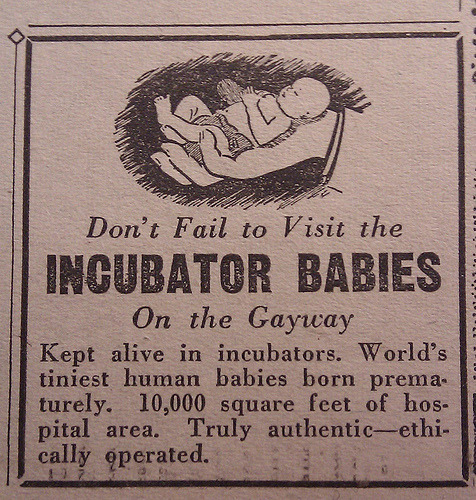 Bear in mind SCBU may have an even more restrictive visitors’ policy than the rest of the wards. If your baby has to start off in Special Care like Sproggett did, above all DON’T feel that you’re missing out on bonding with your little one. I know now that that was hanging at the back of my mind, and it was unfounded. All you need to do is to make up lost time when you are properly reunited – cuddle, cuddle and cuddle more at every opportunity! Was your baby in special care – what advice would you offer to parents? « What ever have you been doing?